Moment Catcher is a universal app download for your iPhone, iPad or iPod touch that allows you to capture reactions to your photos, videos, and favorite YouTube clips on your iPhone and iPad. If you are looking to be the next YouTube superstar or win America’s Funniest Home video, then this is a $0.99 download from the iTunes store not to be missed. Moment Catcher requires activation of location services on your iPhone and iPad app to function. To get started, you view your photos, your videos, and your YouTube videos with a touch on the appropriate choice in the app. When the video starts or the photo slideshow begins, the Moment Catcher app starts filming through the iPhone and iPad’s camera. As soon as you stop watching the video or photo stream, then the filming automatically ceases. 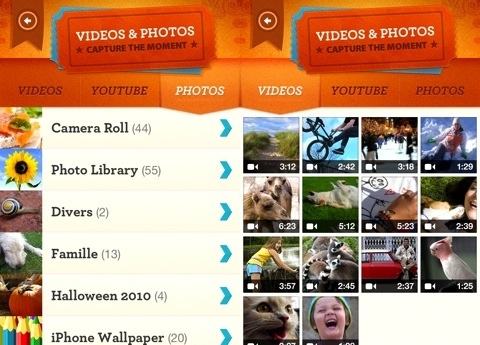 The Moment Catcher app’s video is then saved in your iPhone or iPad’s camera roll. You can view your video reactions within the Moment Catcher app or by scrolling through your camera roll to find it. The moments caught by Moment Catcher have sound and video of your child’s reaction to your videos, YouTube videos, and photos. The interface of the app is quick, simple, and easy. Graphically, it is modern, fresh, and tasteful. Moment Catcher’s developers, Grolux 2 Productions, want particularly for parents to be able to film the reactions of their children to videos and photos. To preserve the spontaneity of your kids and family, the app was designed to film without obtrusive flashing lights or other effects that would turn a natural, unscripted reaction into a show–or in the case of one of my sons, a hand over the screen as he marches out of the room. For younger kids, you will be successful. You’ll be the responsible adult making all of the touches on the screen and preparations. Once you have an older tech-savvy child, they may catch on to what you’re doing. As with any iPhone and iPad apps that use location services, you’ll want to be mindful of data usage and battery drain. In my experience with Moment Catcher, I simply turned it on and off in the Settings menu. I was able to take advantage of the great, useful functionality, but preserve my battery. Moment Catcher is a well-designed app for iPhone and iPad in that it has a specific, sought-after purpose tied together in an aesthetically-pleasing and highly-functional box on your devices’ screens. 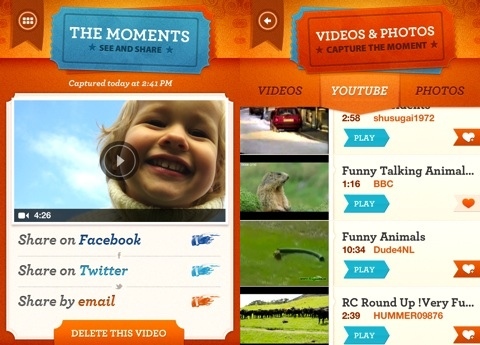 Look for Moment Catcher produced clips to fill your Facebook news feed. AppSafari review of Moment Catcher was written by Jenni Ward on January 10th, 2012 and categorized under App Store, Featured, Fun, Photos, Video. Page viewed 7737 times, 1 so far today. Need help on using these apps? Please read the Help Page. The version 1.2 of Moment Catcher record sound from a YouTube video. Can you update your review ? This post has been updated. The Moment Catcher v 1.2 came out the day I wrote the post, so I must have just missed it. Thanks for the info. This must be cute and funny. Nice advice!